The world of dance is vast. It’s not always easy to realize which dance area and style is the most suitable for a person. While choosing a dance school, one should be guided not only by an opportunity of having fun or having a rest after a working day, as dancing gives us undoubted benefit. 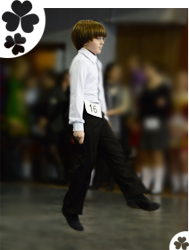 This article is about why Irish dancing is useful and what Irish dance therapy gives us. Slim and strong legs. 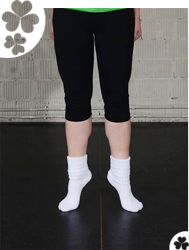 As Irish dancing is very specific, and legs are the dancer’s main instrument, calf muscles are shaped first. Since it is performed with stretched-out feet and on tiptoe, foot arches, their ligaments and the whole instep become stronger. The technique and demands to the dancing form strong legs and develop a nice muscular relief from hips to toes. Majestic bearing, gracefulness, light step. 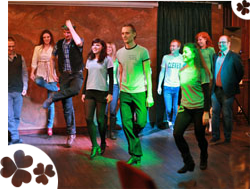 Irish dancers hold themselves upright, square their shoulders, arms are drawn down – thanks to regular trainings one gets used to keeping the back straight in any situations. Such exercises for back are especially useful for those who spend much time sitting at the computer. All the movements are performed on tiptoe with stretched-out legs and turned out feet, so it accustoms dancers to an elegant and beautiful walk. Besides, they are taught to touch down after jumps noiselessly. Such a skill also makes one’s walk lighter. Arms. Arms are used in Ceili and other mass Irish dances all the time. There are special obligatory exercises which help people to hold arms neatly and on one and the same height. As a result, shoulders are strengthened. Forearms and hands are also in good shape. During the process of solo dancing arms are strained and under control, it is forbidden to move one’s arms and bend them, so, turning back to walk, you will get used to moving without gesticulating. Always good shape. Irish dancing is very lively and active, that is why, if you want to lose weight, you have chosen the right way, as this way of dancing is very dynamic and vigorous. Besides, it combines aerobic and muscle-strengthening load, containing lots of jumps. And to perform them right, one has to train his legs and prelum extra. Also back and arms muscles are strengthened. Thus, if you attend the classes regularly, you will always have an opportunity to maintain good shape, control your weight get skilled in dancing and get plenty of pleasure simultaneously. Stamina. In addition to strained legs, straight back and strong arms Irish dancing develops stamina. Coordination and discipline improve as it is necessary to spend some time to master a dance or an element, besides regular trainings which are essential if a dancer desires to do something difficult, discipline and mobilize him. As men never give up! Sense of rhythm. For most women it is easier to catch the rhythm and move in time. And it is more difficult for men. 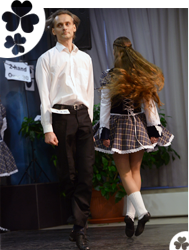 Irish dancing is the best opportunity for getting such skills. When main rhythmic patterns have been learnt, one can set them to any music. So a young man has a chance to become a star at any party or just to surprise his girl with a fine pas while going for a walk. Everything described above is especially important for children’s correct and harmonious development: straight back, nice bearing, healthy spine and heart, stamina elaboration; strong legs and feet, the sense of balance and strengthening of the vestibular apparatus; developing of the sense of rhythm. Memory, thinking are improved, mental faculty is advanced as dancing is a combination of lots of elements tied together into schemes which have to be kept in mind. All this contributes to progress in studies. If a child is a teenager, he will not be left on his own, and if Irish dancing carries him away, he will always be busy and among his friends. 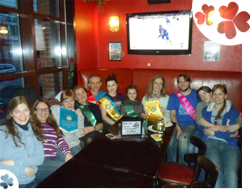 Moreover, Irish dancing is an opportunity to dip into another culture. It is very important both for children and adults that sociability and feeling of comradeship are improved, especially during team dancing; solo dancing and performances on the stage and at competitions make the feeling of inferiority disappear. Quickness of wit develops. Irish dancing is a great opportunity to travel all over the world as most competitions and championships are held abroad. One doesn’t need to be an advanced dancer for taking part in them as the participants are divided into groups according to their age and level. It gives anyone a chance to be a winner. Everybody knows that dancers experience physical load but most don’t know that endorphins are produced while dancing. Thanks to them we get pleasure. One feels especially nice when he manages to do what he couldn’t have done for a long time, when he gets a real opportunity to perform his favorite dance to his favorite music, and then he understands that it is not an unrealizable dream. And speaking about competitions and performances, they give vivacity because of a fair amount of adrenalin dancers get. And it goes without saying that elation of a long-expected and deserved victory at a championship or a successful performance cannot be compared to anything! One gets an aim and a splendid hobby. If you have a dream to become an Irish dancer, it will surely come true. The classes are one more opportunity to have a rest after a working day, to find like-minded people or just to communicate with nice people in a friendly atmosphere. And as it is mentioned above, one can be realized as a dancer taking part in competitions and as a teacher after passing the needed exams. Creating a dance you prolong your psychological youth. And the classes themselves are sport, therefore, tonus of your body. Thus, it is going to remain young for many years. Dancing gives an opportunity to keep the muscles and the whole body in good shape and remain in good spirits for a long time. All site's articles written by members of our team and are unique. Placing our articles on your own resources is possible with the permission only with an obligatory active hyperlink to the source http://killarney.ru/irish_dance_therapy_en.